I've been perusing carbonara recipes for months. 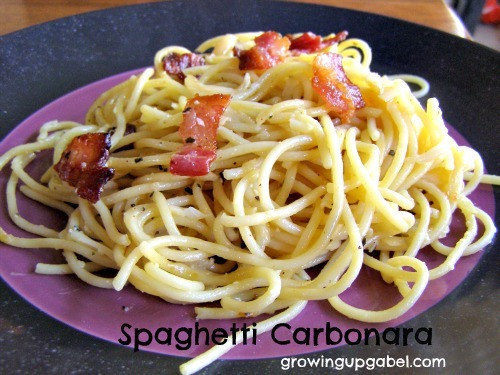 The combination of bacon, pasta, and Parmesan cheese just sounds delicious. But I kept getting hung up on the egg. I just wasn't sure about putting eggs in my pasta. I had visions of bacon, pasta, Parmesan cheese and scrambled eggs. Finally, I decided to be brave and just go for it — and it's wonderful! The egg makes the pasta creamy and you can't taste it at all. I totally messed up this recipe because I didn't bother to read through the recipe before I started cooking. I didn't realize that the pasta needed to be hot and I cooked the spaghetti first and let it sit in the strainer in the sink. So instead, I added the spaghetti to the frying pan after the onions and garlic were done cooking, stirred it all together and let the pasta warm up. Then I added the egg and stirred quickly to coat the spaghetti. I turned the heat off, kept stirring, and added the bacon and cheese. It worked perfectly! In a large frying pan, cook bacon until crisp. Remove with slotted spoon and set aside. Saute onion, garlic and basil or sage in the bacon grease over medium heat until onion is soft. Be careful not to burn the garlic. Strain spaghetti and return to pot immediately. Make sure it's HOT! Pour onion, garlic, basil/sage and eggs over hot pasta and stir to cook the egg. Stir in bacon and Parmesan cheese. This looks awesome! I will be making this very soon!